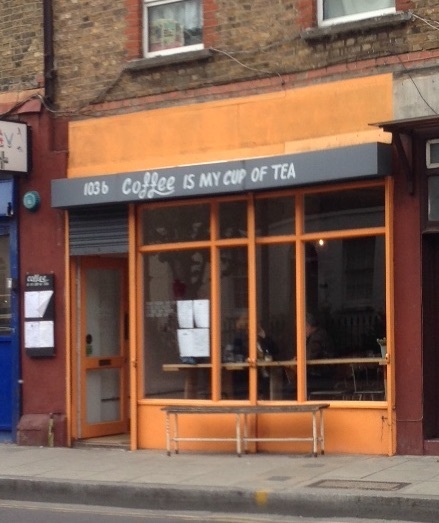 Coffee is my cup of tea on Dalston Lane. The colour of the exterior matches the crockery used inside. There is a lot of truth in the name of this café. 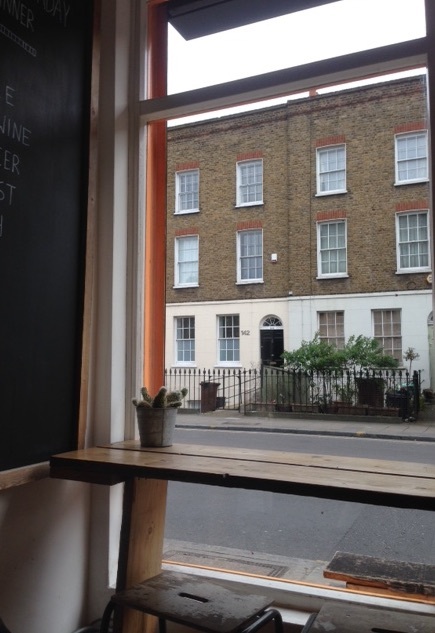 “Coffee is my cup of tea” in Hackney is a lovely retreat, a place where you can take time to enjoy whatever drink is your cup of tea. Walking through the door, you are presented with a few wooden tables and a cocktail menu on the wall. A breath of calm on an otherwise busy road. Together with the bench just outside, there is plenty of seating inside. There’s even a long table along the window where you can sit if you would like to enjoy your coffee while gazing at the passers-by. There were the usual range of coffees on offer along with fresh juices, other drinks together with a range of food. When we went in the late afternoon, there didn’t seem to be many cakes on offer but maybe we were just unlucky. Coffee only this time. The coffee is roasted by Assembly and there is of course tap water available at the end of the bar. Facing the bar, glued to the wall, were a circle of stiletto shoes. Forming what seemed to be a “shoe star”, they were one of a number of art works around the shop. The café is also quite spacious, the window at the front providing plenty of light and contributing to the relaxed space. When my long black arrived, the light coming in from the windows produced great interference patterns on the bubbles of the coffee, an irresistible piece of coffee physics. The cocktail menu provided quite a distraction, again making the point that it was a shame we visited on an afternoon: an evening of coffee and cocktails would make a lovely night. 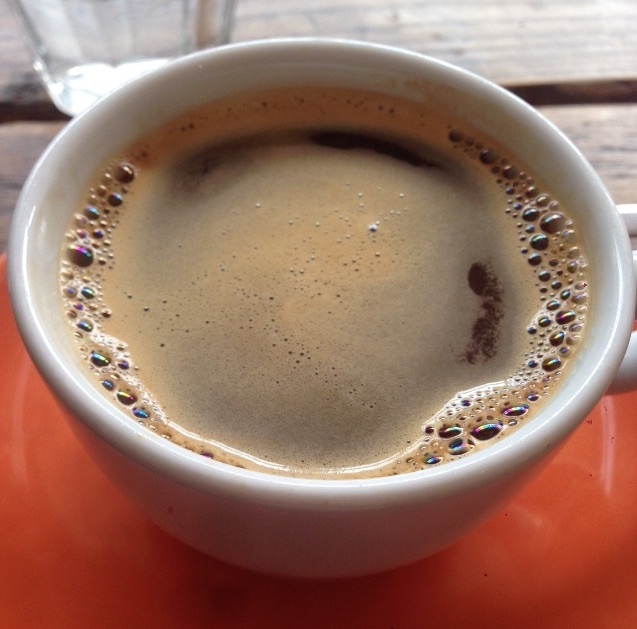 However, a sunny afternoon was a great time to sip and enjoy a long black. While the long black started off very fruity, the taste changed (matured?) as the temperature of the coffee decreased. In the background to this all though, something so subtle as to be almost un-noticeable caught my attention. Completely surrounding the window was a very thin piece of copper wire. Were there tiny little lights on it to make the café more attractive (romantic even?) in the evening? I couldn’t see any. From our table, it seemed as if it was just a thin, closed loop of copper wire forming a loop around the window. Such a loop could be used as a radio antenna, a “loop antenna”. Indeed, when Heinrich Hertz (1857-1894) first discovered radio waves in 1887-8, he used a (gapped) loop antenna as the receiver. Hertz had been trying to test James Clerk Maxwell’s theory that visible light was part of a much broader spectrum of electromagnetic waves, particularly, that there should exist very low frequency waves far beyond the visible region of the spectrum, waves that we now know as “radio waves”. Radio, TV, wifi, all things that seem so obvious now but were really only predicted and discovered relatively recently. Working in his laboratory in Karlsruhe, Hertz set up a radio generator which consisted of two brass balls that were charged until a spark flashed between them. Sitting a few metres away, a gapped loop of wire, the ‘loop antenna’ suddenly showed a spark over the gap. The spark that Hertz had generated in one part of the room had been mysteriously transmitted, as if through an aether, to be picked up by the antenna a few metres away. Clearly it was consistent with Maxwell’s predictions. The electric spark had generated a low frequency electromagnetic wave that had been picked up with the loop antenna. With further experiments, Hertz showed that this wave was indeed reflected and refracted in the same way as ordinary, visible, light and even determined its wavelength (which for Hertz’s experiment was about 66cm)¹. It is probably easiest if you visit the cafe but look very very closely at the frame of the window. There is a copper wire surrounding it. Although Hertz did not immediately see any practical application of his result (beyond the fact that it was a test of Maxwell’s theory of light), ‘radio’ soon started to be developed. Marconi and others worked with wavelengths of 200-600 m to transmit radio waves across the Atlantic Ocean¹. As amateur radio enthusiasts got hold of radio sets in the 1920s they started working with wavelengths that were initially considered impractical for applications (much shorter than the hundreds of metres used by Marconi). These enthusiasts soon realised that they could communicate with other enthusiasts in distant countries through the reflection of the radio waves off of the (until then unknown) ionosphere¹. Gradually our understanding of radio waves and antennae design developed, leading to further, unexpected applications. Depending on the design of the antennae, radio waves (and microwaves, which have a slightly shorter wavelength of the order of 0.1-100cm*) could be made to be directional. So antennae could be made that transmitted waves only in set directions (or conversely could detect the direction from which radio/microwaves originated). This understanding of antennae design would lead to advances in Radar technology. Which brings us back to the loop antenna at Coffee is my cup of tea. Loop antennae are grouped into two types, “small” and “large”. It is fair to say that it is a large window at Coffee is my cup of tea and so the loop antenna there would fit into the “large” category. These antenna are ‘resonant’ (meaning that they respond most) to wavelengths equal in length to the circumference of the antenna. From memory, I’d guess that the window was roughly 2m high and 3 m across, meaning it had a circumference of 10 m. We can calculate the frequency of the radio waves that would be resonant with this by using the fact that the frequency (f) is just the speed of light (c) divided by the wavelength (λ) (ie. f=c/λ). The speed of light is 3×10^8 m/s, so the frequency would be (3×10^8)/10 = 30 MHz. There are two last things to notice about this result. First, the name of Hertz lives on in the unit of frequency (Hz). Secondly, the loop antenna around the window at Coffee is my cup of tea is resonant with approximately the frequency of Citizens Band radio (CB radio operates at ~27 MHz). Which may make us question once more what this loop of wire is doing at this friendly little café on Dalston Lane. *Technically Hertz discovered microwaves rather than radio waves. However, given neither were named at the time and they are both of longer wavelength than visible light, it is perhaps too pedantic a point.